Anambra Guber Election: APC Move To Reconcile Aggrieved Candidate. The All Progressive Congress (APC) has set up a Reconciliation Committee to handle the fallout of the governorship primary in Anambra State. The committee was mandated to reconcile aggrieved members to ensure the party go into the election united. Inaugurating the committee at the party secretariat in Awka, state Chairman, Barr. Emeka Ibeh said reconciliatory efforts would begin in earnest as the governorship campaign kicks off next week. “The mandate of the committee is to reach out to aggrieved aspirants who may have natural misgivings on the outcome of the primary election which threw up Nwoye as the candidate for the November 18, 2017 election.” he said. Ibe expressed optimism that the APC will capture Anambra state government house come March 8, 2018. The Committee, headed by running mate to APC’s gubernatorial candidate, Hon. Dozie Ikedife Jnr, has Tony One-Week Muonagor as Secretary, Chief Chidi Ebede, John Bosco Onunkwo, George Ozodinobi, Tony Akaenyi and Chibuzor Obiakor. Others are Chief Uzoma Onwuachu, Osy Ezenwa, Barrister Hyacinth Nweke, Hon. Celestine Ughamadu, Calista Nwachukwu, Ike Ekwensi and Alex Ekemezie. Recall that Tony Nwoye beat Senator Andy Uba, Engr. 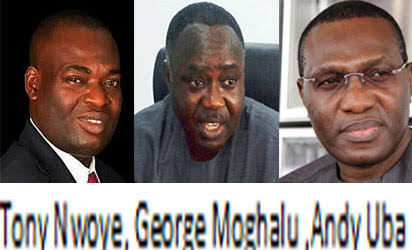 Barth Nwibe, George Muoghalu, Patrick Nwike among others to emerge winner of the August 16 primary. Last week, the APC National Working Committee affirmed him as the party’s standard bearer for the November 18 governorship election. The party also hailed the primary election conducted by Governor Kashim Shettima, describing it as free, fair and transparent.